I don't know if this has been asked for before but I miss the option in AP (separated mode) to auto-resize windows when zooming in and out. I'm used to work with multiple images open and drag things from one to another or just compare them side by side. Having to resize windows manually is a bit annoying. Can this option be turned on and off just like Photophop? I forgot to mention that I'm using AF 1.7 beta. Hey Roberto Costa, welcome to the Affinity Forums. Which option in Photoshop do you mean? Is it one of the options in Window > Arrange? No. I'm not talking about window tiling. It's the option shown in the screenshot below. Zoom Resizes Windows (in separated mode, not tabbed mode). Ah, I see what you mean—thank you. We definitely don't do this but it would be a nice feature request. I've passed your feedback on and I'll also move this to the Feature Request section. This has definitely been asked for before. With every beta or new release I download I am always crossing fingers for getting that kind of window behaviour. 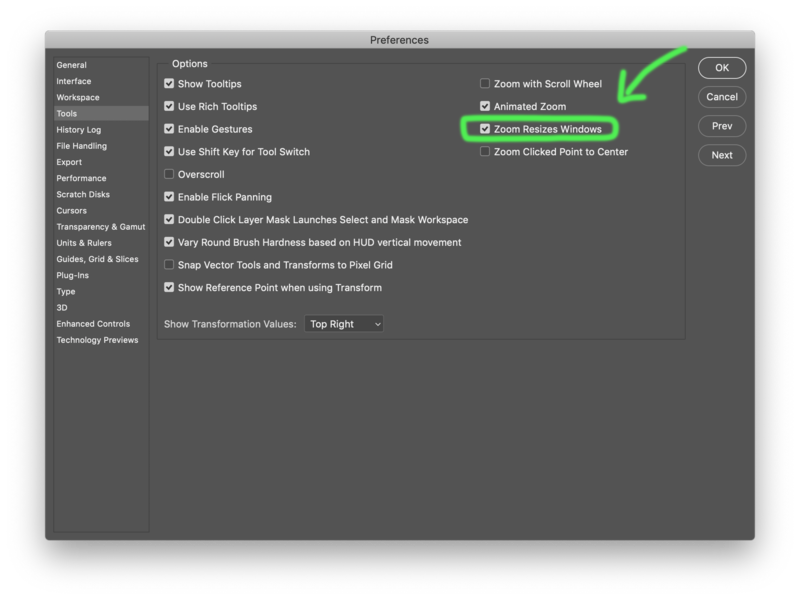 While we're at it - being able to have the program auto-arrange open documents a la Photoshop would be a god send too (Window -> Arrange -> Horizontal, Vertical, Stacked,...).